On June 23, 1850, twenty-eight-year-old Amanda Lamme, a California-bound emigrant, died of cholera and was buried near here in what is now private pastureland. She was the wife of M.J. Lamme of Boone County, Missouri, and mother of three daughters. The monument that marks her grave was erected in 1912. It was incorrectly engraved with the name Amanda Lamin. Between 1842 and 1859 an estimated 20,000 emigrants, about 5 percent of the total, died along the overland trails. Cholera in 1849, 1859, and 1852 caused many adult deaths. Few children died from this. Malaria, smallpox, measles, and dysentery took a toll of children and adults alike. Although wagons moved slowly, people were sometimes crushed beneath the wheels. Drownings were common at river crossings. Accidental shootings were frequent because many travelers were unfamiliar with the use of firearms. Contrary to movie and television portrayals, few emigrants were killed by Indians. The risk of death probably was about the same for the emigrants as for the people who stayed at home. 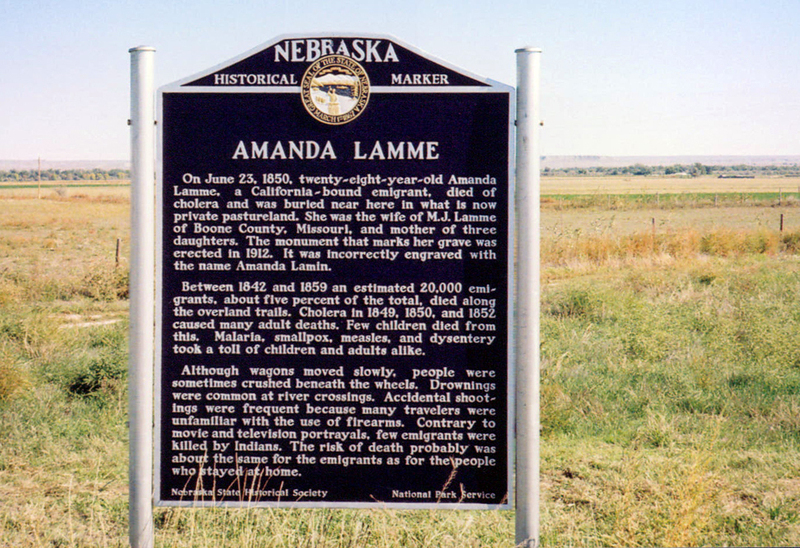 “Amanda Lamme,” Explore Nebraska History, accessed April 19, 2019, https://mynehistory.com/items/show/362.